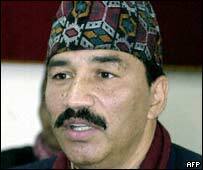 Five ministers from Nepal's ousted royalist government have been arrested. They include the former home, foreign and information ministers, state radio said. Reports say three senior security officials have also been suspended. The move follows the launching of an inquiry into alleged excesses committed by officials in last month's crackdown on protests which ended palace rule. 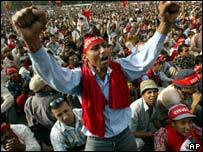 Police in Kathmandu have been told to hold the ministers for 90 days on the orders of the newly-formed government. There was no immediate official comment on the arrests or the suspensions. Those arrested were former Home Minister Kamal Thapa, Foreign Minister Ramesh Nath, Information Minister Shrish Shumsher, local development minister Tanka Dhakal and junior minister Nikshya Shumsher Rana, state radio said. Senior police chiefs Shyam Bhakta Thapa and Sahabir Thapa and National Investigation Department chief Devi Ram Sharma have also been removed from office, reports say. The commission decided that in their present office they could potentially compromise the investigation into human rights abuses, Nepal radio reported. The panel probing alleged excesses by the authorities is expected to present its findings in two months' time. Twenty people were killed and several hundred injured during the April protests when security forces used tear gas and fired live and rubber bullets at crowds. King Gyanendra reinstated parliament and an interim multi-party government was formed following the protests, which took place across Nepal. He had seized power in February 2005 accusing his government of failing to secure peace talks with Maoist rebels and failing to prepare for elections.